The workshop on “Change” organize on 15.01.11 in “Velocity”. The workshop intitive taken by Mr. Avinash Wani. 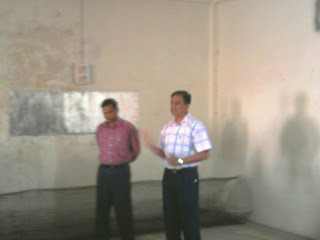 The workshop has conducted by Mr. Avinash Wani & Mr. Kaushik. In the workshop from organization total 22 staff has attended. The workshop beginning has done with the prayer. Why we are coming to work. 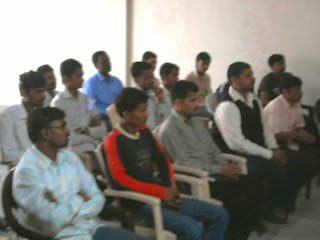 Participants has given spontaneous response and came out with following points. In the workshop below mentioned subject are taken for understanding it well.. In the session given one incident of Ship accident & instructed team to pick up the things by own choice survive on island material for saving life. It gives moral for us like Team work, coordination with team members think beyond self imagination, every problem has its own solution, keep your confidence high. 1)Choose your leader for work then planning the work properly before indulging into it. 2) For any work basic foundation is important. 3) Team work– Team is not only a set of people but one individual. 4) It was successfully done by team – Anil Pardeshi, Sandip Mulik., Yogita, Bhanudas sakat, Rahul Bansode, Sunil Modak. Participants had made the highest tower with the group. 2) planning to consume the available things & work within provided material. 3) Main thing is foundation for work i e basic in the work will give good results. Sanjeev Palod has told about the importance of core values in the organization.and very effectively & nicely explained it through one story of hardworking and integrity. Also he told values cannot be changed even circumstances change. and after this Mr palod has asked about workshop the participants has given spontaneous reply and told all points covered in this session. & also requested for such kind of workshop should continuously organize. To learn about the facing the problem in every situation and confidence is important thing for completion of work. Time Management: Making a circle chain and passing the ring from one by one & end up to the starting point. Defination of Success: Successis realizing your potential. In the beginning they made of targeg of 95 seconds & actually happened in 18 seconds. They came to know from it. The potential should be judged properly before planning for work. Learn from mistakes & think for better execution of the same work. One can never be trained , one can only be learned. Successfully done by the team: Mr. navnath, Bhanudas Sakat, Vijay Modak, Sunder, Kadam, Kiran; Survashee.shekh. on even in reverse situation too they will able to do any work perfectly in time. Successfully done by the team: Mr. Kamble, Vikas, Yogita, Vishal Ghule, Sandip, Sakat,Mahesh Jagtap.Premsingh. Definition of success is elaborated with examples for realising the potential of self. And for leadership is the terminology is taking responsibility and completing with good results. Through different games above game concept & their importance in daily work & in life perfectly explain in very simple understandable language by Mr.Avinash Wani. Also Mr. Kaushik, Mr. Ganesh Omble, & Mr. V. Patil. help a lot for happening this WORKSHOP healthy & fruitful . All the participant has came out of workshop with smiling face & with the commitment to their self they will be ready to do the efforts more than 110% . Also in their written feedback they have given many of promising things they learn form it. (1.) India's emergence as a superpower will show that it is possible to lift millions of people out of poverty within one generation while embracing pluralism, a free pace & a vibrant multiparty democracy. (2.) India has the potential to serve as a leading example of how to combine rapid economic growth with fairness towards & inclusion of those of the bottom rungs of ladder. (3.) The prospects are high that, by 2025, India will likely emerge as one of the world's least corrupt developing economies. (4.) India will likely emerge as one of the world's leaders in leveraging information technology(IT) to boost the effectiveness & efficiency of its institutions - the corporations, the government as well as civil society organizations. (5.) India will almost certainly become a leading example of efficient resource utilization, especially in energy. (6.) India is likely to emerge as one of the world's leaders in market driven innovation. Adversity combined with ingenuity has always been the mother of innovation. (7.) India in 2025 is also likely to emerge as one of the world's most entrepreneurial societies. Given a culture of individualism, Indian's are "born " entrepreneurs. (8.) India will not emerge as a superpower unless it is smart about managing the evolutionary process of getting from here to there. The seeds for the tree that India as a superpower will be are being planted right now. How can young professional transform themselves into better leaders of tomorrow? Firstly, you’ve got to educate yourself because the half life of knowledge is three years. You can’t just know a few things and get away. The once who will survive are those who are constantly learning, changing and adapting. Young people should not think about how much they get paid where they can be more successful, etc. Instead, they should think about how best they can contribute to the society leave a lasting legacy behind, etc. What significance does re-skilling hold in leadership development? First of all, leaders are made and not born. But remains on constant and continuous learning, unlearning and relearning. (1.) Wishing all of you a very happy & prosperous New Year 2011. (3.) Pidilite has done all time record sales of Rs. 7.65 cr . Congartulations to Ganesh & team. (4.) Lupin has maintained there DSO of 20 days. Good efforts given by the team and they are planning for 18 days DSO. (5.) On very 1st day of the New Year Adani depot has successfully given stock audit with no discrepancy. Congrats to Yogesh & his team. (6.) Mr. Nikhil Palod has got the best batsman award in Inter Society cricket tournament held at Ahmednagar. Heartly congratulation to him. (7.) Amway store incharge Mr. Vijay Modak’s father has passed on20th Dec 2010. May his soul rest in peace. (a) Customer service above all else. (b) Every individual must be respected. (9.) Mr. Sachin Rathod has joined to us in Lupin depot. He has B pharm & having experience in pharma industry as a area manager in Astrabeam Health Sciences, Mumbai. (a) Customer service above all else - We will be taking steps to achieving this goal. (a) The fact remain that the only place where success comes before hard work is in a dictionary. (b) Hard Work – As the saying goes, talent is cheaper than table salt, what separates the talent from the successful is the sheer dynamism hard work. Sharrukh Khan is the best example of what persistent hard work & determination can do. (c) Doctors, psychologists, coaches, mentor and just about everybody maintained that it was humanly impossible to cross a mile in less than 4 minutes. Every athlete accepted that as a norm, but not Roger Bannister, who broke the barrier through sheer hard work. In 1954, hailed now as the miracle run, he defied all logic as he speed past 45 others runners and crossed the finishing line in 03:59:04 seconds. History was created that day because it was his hard work that gave shape to his passion. The high carat diamond had been cut very well. The very nexy year about two dozen people crossed the mile in less than 4 minutes. Today, this is an expected norm. George Washington Carver, a chemist who discovered over 325 uses for the peanut, once remarked, “99% of all failures come from people who have a habit of making excuses”. (d) Simply said, there is no short cut to success. Nothing compares to the power of sincere & dedicated hard work. The best success stories have been scripted by individuals who have never shied away from hard work, & have performed when it mattered.